A ballpoint pen (also known as a Biro or ball pen) is a writing instrument which dispenses a viscous oil-based ink from an internal refill through the rolling action of a metal ball at its point. Millions are manufactured and sold everyday, worldwide, with their low-cost and omnipresence you can enjoy reliable writing at anytime or anywhere. Revolutionary new ink system, InkJoy 100 gives you the best in effortless writing. Triangular barrel for comfort, control and maximum smoothness. No smear ink delivers crisp, clean lines every time. Medium point 1.0 mm ballpoint pens with clear barrels. Box of 12 pens, Cap identifies ink colour. Convenient bulk box of the revolutionary new ink system, InkJoy 100 ballpoint pens. Box of 50 pens, Cap identifies ink colour. Reliable high performance medium ballpoint pen at the right price. Writes evenly and smoothly without skipping. Lightfast ink dries immediately and is smudge proof. Medium point (0.35 mm line width) ballpoint pens with clear barrels. Box of 10 pens. Cap identifies the ink colour. The reliable ballpoint that goes with the flow for fine writing. Smooth-writing performance and reliability at an affordable price. Fine point 0.7 mm ballpoint pens with yellow barrels. Box of 12 pens. Cap identifies the ink colour. The iconic #1 best selling pen worldwide. Bulk box of the #1 best selling pen worldwide. Box of 50 pens. Cap identifies the ink colour. Smooth-writing, classic BIC Cristal Ballpens come with a long cord that you can secure wherever you want, saving you money on lost pens. Attach these pens to clip boards, reception desks, or around your neck! Box of 12 pens. Tip identifies the ink colour. Quality ballpens at an economical price. Choice of Medium point 1.0 mm or Fine point 0.7 mm ballpoint pens. Box of 12 pens. Barrel colour indicates ink colour. FlexGrip Ultra ballpoint pen features a comfortable rubberised barrel with gripping rings for secure handling. Lubriglide® ink system provides smooth, consistent writing and bold, vivid lines. Choice of Medium point or Fine point ballpoint pens with rubberised barrels. 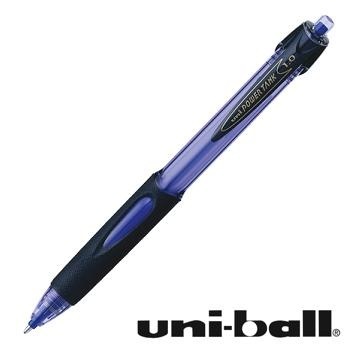 Convenient retractable model with all the benefits of the popular FlexGrip Ultra ballpoint pen. Fine point retractable ballpoint pens with rubberised barrels. Cap identifies the ink colour. PaperMate's Smoothest Pen... The Profile has a bold, extra smooth writing system. Features a soft, comfortable grip and stylish body for an excellent writing experience. 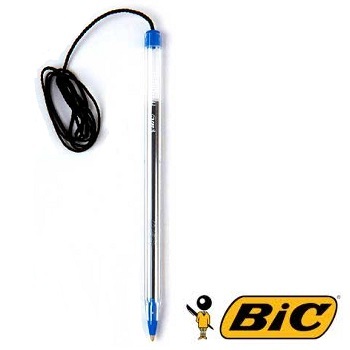 Bold 1.4 mm tip retractable ballpoint pen with pocket clip. Box of 12 pens. Body denotes ink colour. Retractable InkJoy 700 RT ballpen with revolutionary new ink system... see how it feels. The perfect blend of understated elegance and modern style. Features integrated contour grip, for comfort and control, and metal accents for durability. Medium point 1.0 mm retractable ballpoint pens. Box of 12 pens. Available in Black or Blue ink. One of the best known pens and still a firm favourite! Retractable ballpoint pen with pocket clip. Box of 12 pens. Barrel identifies ink colour (fine blue has orange barrel). Soft cushioned rubberised barrel provides great no-slip grip for better precision and control. Features special grooved finger grip area that comfortably fits in your hand, requiring less pressure to grip. Sleek, European design retractable ballpen with chrome detailing. Full-length rubber grip provides the ultimate in writing comfort. Medium point 1.0 mm retractable ballpens. Refillable. Comfortable rubber grip ballpoint pen for fatigue-free writing. New formula ink allows a smoother flow when writing, than traditional ballpoint inks. Available with Fine 0.7 mm, Medium 1.0 mm and Broad 1.4 mm stainless steel tips. Box of 12 pens. Cap/Barrel colour denotes ink colour. Comfortable rubber grip retractable ballpoint pen with pocket clip to keep pen accessible. 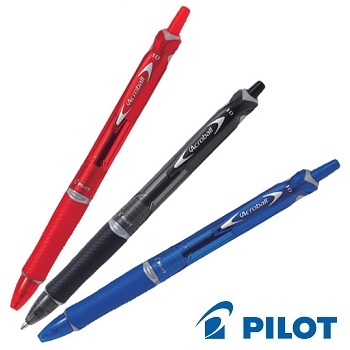 Refillable, retractable ballpen with a rubber grip for fatigue-free writing and user comfort. A pressurised ink delivery system enables the PowerTank pens to continue writing upside down, in extreme cold (up to minus 20 degrees) on shiny surfaces, wet paper and even underwater. Medium 1.0 mm stainless steel tip retractable ballpoint pen. Box of 12 pens. Refillable. Choice of colours available. Fine 0.7 mm stainless steel tip retractable ballpoint pen. Write With Ease. Quality ballpoint pen offers extra smooth writing... will not skip or blob! Slip proof ribbed grip for comfort. Colour coded cap with pocket clip and clear barrel for viewing ink supply. Fine ballpoint pens with tungsten carbide 0.7 mm ball encased in a stainless steel tip. Refillable. Medium ballpoint pens with tungsten carbide 1.0 mm ball encased in a stainless steel tip. Refillable. The Pilot Acroball has a new ballpoint ink designed to produce a superior writing performance. The unique rubber tyre grip enables you to grip the barrel tightly, enhancing your writing technique. Uses a new ink formula that is quick drying, water resistant and also archival quality. Medium 1.0 mm ballpoint pens with tungsten carbide ball encased in a stainless steel tip. Refillable. 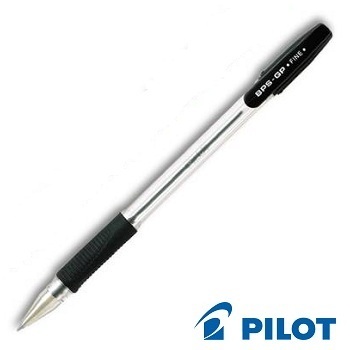 Retractable ballpoint pen with metal pocket clip and clear barrel with all the famous benefits of the popular BP-S.
Slip proof ribbed grip for comfort. No more ink stained pockets. Choice of Medium point 1.0 mm or Fine point 0.7 mm retractable ballpoint pens. Box of 12 pens. Refillable. Premium quality and perfectly balanced ergonomic rubber gripped ballpen. The grip has a triangular cross-section that utilised the thumb, index and middle fingers. Uses Pilot's advanced formula oil based ink for very smooth writing. Fine 0.7 mm ballpoint pens with tungsten carbide ball encased in a stainless steel tip. Refillable.